Remember a time when soda wasn't a four-letter word? Before corn syrup replaced cane sugar and chemicals became “acceptable” substitutes for real ingredients? Those were the days when soda was a more innocent treat. We do. And we’ve spent years crafting a soda that’s like no other; one that we could proudly serve to anyone, even our children, guilt-free. Some said it couldn’t be done. We politely disagreed. Then committed ourselves to crafting the world’s finest organic, low-calorie soft drinks. A soda like no other. Say hello to Veri. A truli different kind of soda. Veri Organic Soda is so good! I don't drink soda very often but I do get a craving for soda every so often and I'm glad that I found a healthier option to satisfy my cravings. 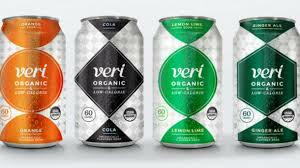 Veri Organic Soda comes in Orange, Lemon Lime, Cola and Ginger Ale. I absolutely love all of these flavors! I love that Veri Organic Soda doesn't contain corn syrup, is all natural and organic. I also love that this product gives all of us soda drinkers out there a healthier option! Click HERE to locate a store near you that sells Veri Soda. Follow Veri Soda on social media!